The brutal murder of paperboy Carl Bridgewater horrified the nation. The 13-year-old was shot and killed after disturbing burglars, during his round, at Yew Tree Farm in Stourbridge, West Midlands, on 19 September 1978. In the ensuing outcry, pressure was put on police to bring the case to a swift conclusion. This involved not only the then Staffordshire police force, but a small army of extra police from the West Midlands Regional Crime Squad. Cousins Vincent and Michael Hickey's long fight for justice began after small-time crook Patrick Molloy was arrested by police in 1978 for a similar robbery which took place at nearby Chapel Farm, Romsley, two months after the Yew Tree Farm robbery. Molloy made a statement that he had been at Yew Tree Farm on the afternoon Carl was shot, but had been in a bedroom upstairs. Soon afterwards, the Hickeys and a fourth man, James Robinson, were arrested. 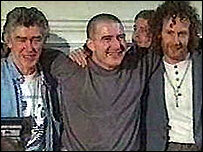 All three were found guilty of murdering Carl, in November 1979 following a month-long trial at Stafford Crown Court. Vincent Hickey, who was 25 at the time of the conviction, was jailed for life with a recommendation that he serve at least 25 years. Michael Hickey, who was just 17, was - because of his age - detained at Her Majesty's pleasure. Molloy was convicted of manslaughter and aggravated assault and was sentenced to 12 years. He died in prison. The case against the Hickeys and Robinson has been described as one of Britain's worst miscarriages of justice. The Hickeys said they endured harsh conditions in prison and suffered psychiatric illnesses. They spent 18 years behind bars before finally being released in February 1997 after the Court of Appeal quashed their convictions. Defence lawyers brought new evidence based on advanced technology which showed two police officers had fabricated and forged a confession from Vincent Hickey in order to bully a crucial confession from Molloy. Appeal Court judges agreed and quashed the mens' conviction. The move ended years of campaigning against the convictions, inclduing rooftop protests. Vincent Hickey was awarded more than £500,000 compensation and Michael Hickey £990,000.